Mixing different types of outlet ventilation can interfere with the essential inlet flow of air at the soffit. Reduced inlet air flow at the soffit reduces all air flowing up and along the roof sheathing - essential for dry sheathing, a healthy home, and a healthy you!. Ever hear the expression, less is more? Not so for outlet vents. If you have more than one type of roof outlet vent, choose the most efficient type. Then eliminate all other outlet vent styles. Mold and mildew are rapidly becoming a major health issue in homes all over the United States. In August, I was contacted by Air Vent, Inc., asking me to share my experiences with homes that do not have proper attic ventilation. Air Vent, a manufacturer of attic ventilation products based in Dallas, Texas, was gathering material for its seminars designed to further educate roofing professionals about the importance of proper attic ventilation in today's homes. When people are advised not to mix outlet vents, they look confused and in disbelief of that advise. Until recently, our thinking has been that "more is better." But more isn't better! As most of you already know, the best way to ventilate a home is to install continuous soffit inlet vents and continuous ridge outlet vents. How many times have you heard that, right? But, what I'll bet you haven't heard is that mixing outlet vents can be a serious mistake. The dominant outlet vent has been proven to convert the weaker outlet vent into an inlet vent, eliminating the needed air draw up from the soffit area. Upon investigating this home pictured below, we discovered a roof with two kinds of outlet vents - gable end vents, and a centrally located power attic ventilator. Airflow will seek the path of least resistance. When the power attic ventilator was activated in this one-year-old attic, instead of air being drawn up from the soffit vent, air was sucked in through the gable end vents. Now, you may say, "So what? Air is still flowing, isn't it?" NO! Not where it is needed to be flowing, along the entire underside of the roof's sheathing, gathering up and removing water vapor. The results: Condensation on the lower roof section due to decreased air flow in from the soffit vents, allowing water vapor, droplets, moisture, "life-giving" liquid to form on the lower roof sheathing! Unfortunately, that life manifests itself in the form of mold and mildew, and in severe cases, wood rot. Why? 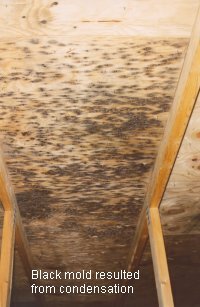 Because you now have a perfect medium for mold growth - dark, moist, nutrient-rich plywood, with its glues, and wood and other organic matter now helping to nurture and sustain their growth. NOT GOOD! Notice in the photographs, the mold growth decreases towards the top of the roof. Why? Because the upper roof area has the most air flow, in from the gable end vents and out through the top, center power attic ventilator. As homeowners become more and more conscious of rising energy costs and the need to conserve, we as a Nation are building tighter and tighter homes. Unfortunately, tight is not necessarily healthy. 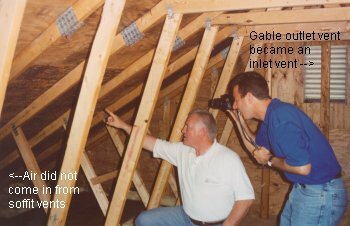 And, unfortunately, many contractors and homeowners are not aware of the extreme importance of proper attic ventilation. This need for ventilation is compounded by these tightly built homes, which do not have the old fashioned air leaks, allowing homes to breathe. If you learn one thing from reading this article, let it be that there must be air flow in the attic, starting at the soffit inlet vents and extending along the roof sheathing to then be exhausted out through the outlet vents. Mixing different types of outlet vents interferes with that flow of air. Therefore, reduce multiple outlet vent types to only one. Please check your attic for mold, check your roof for outlet vent styles, and take the appropriate action to eliminate "more" styles of vent before winter, because "less is more!" real estate inspector, roofing tools inventor, and home inspector instructor. THOR Systems, Inc. "The Helper Of Roofers"
�2001 - 2011 Ron Hungarter Associates, Inc.